This product is brought to you by an. So you know you are. 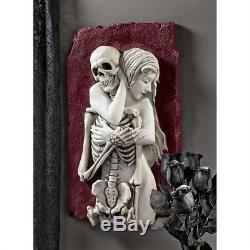 Halloween Flesh & Bone Skeleton Resin Hand Painted Wall Sculpture Haunted House. Life embraces death in this almost two-foot-high skeleton wall sculpture that beckons every eye in a room to its arresting subjects. From the hand-painted blood red background, alabaster flesh expresses rapture and encircles a bony skeleton in a bas relief sculpture. Our Skeleton Wall Sculpture is captured in quality designer resin and hand-painted one piece at a time. Tracking Information Will Be Provided. We know its NO fun if your item gets lost or damaged. We Appreciate All Of Our Customers And We Want You To Enjoy Your Shopping Experience With Us. The item "Halloween Flesh & Bone Skeleton Resin Hand Painted Wall Sculpture Haunted House" is in sale since Monday, June 4, 2018. This item is in the category "Collectibles\Holiday & Seasonal\Halloween\Current (1991-Now)\Decorations\Other Current Halloween Décor". The seller is "gknz" and is located in Owings Mills, Maryland. This item can be shipped to United States, Canada, United Kingdom, Denmark, Romania, Slovakia, Bulgaria, Czech republic, Finland, Hungary, Latvia, Lithuania, Malta, Estonia, Australia, Greece, Portugal, Cyprus, Slovenia, Japan, China, Sweden, South Korea, Indonesia, Taiwan, South africa, Thailand, Belgium, France, Hong Kong, Ireland, Netherlands, Poland, Spain, Italy, Germany, Austria, Israel, Mexico, New Zealand, Philippines, Singapore, Switzerland, Norway, Saudi arabia, Ukraine, United arab emirates, Qatar, Kuwait, Bahrain, Croatia, Malaysia, Brazil, Chile, Colombia, Costa rica, Dominican republic, Panama, Trinidad and tobago, Guatemala, El salvador, Honduras, Jamaica, Antigua and barbuda, Aruba, Belize, Dominica, Grenada, Saint kitts and nevis, Saint lucia, Montserrat, Turks and caicos islands, Barbados, Bangladesh, Bermuda, Brunei darussalam, Bolivia, Ecuador, Egypt, French guiana, Guernsey, Gibraltar, Guadeloupe, Iceland, Jersey, Jordan, Cambodia, Cayman islands, Liechtenstein, Sri lanka, Luxembourg, Monaco, Macao, Martinique, Maldives, Nicaragua, Oman, Peru, Pakistan, Paraguay, Reunion, Bahamas, Viet nam.